You don’t need a passport to experience traditional Greek food. A trip to any one of these New Mexico restaurants will do just the trick. Take yourself out for a meal from a country that has some of the healthiest and tastiest fare in the world. From fresh veggies and tzatziki sauce to loaded-up gyros, here are the best Greek restaurants in New Mexico. There’s a reason this restaurant is called Gyros. That’s what they do best! Sandwiches come with a combination of broiled beef and lamb, served on traditional pita bread with veggies and a creamy tzatziki sauce. Plus, you can order one with double meat and still get everything else. There’s plenty of other menu choices, favorites like dolmas and spanakopita and, of course, a feta-and-olive-rich Greek salad with a house-made dressing. There’s a saying, “beware of Greeks bearing gifts,” unless the gifts are plates of food brought to you by the waitstaff here. Then, accept and enjoy every morsel on the plate that’s set before you. Highlights include a pork souvlaki and feta cheese sandwich. It wouldn’t be a Greek restaurant without a rich, creamy hummus or a sweet, gooey baklava. You’ll find both. Vegetarian and vegan options available. This a little bit of cross-over here that gives diners a dose of fare under a Mediterranean umbrella. Greek food is well-represented, though. Try the beef moussaka, the chicken lemon soup or the roasted leg of lamb salad for a classic meal. The made-from-scratch pita pairs perfectly with the fresh made hummus. It wouldn’t be a Greek meal without homemade baklava. You’ll find that too. The only thing that’s not Greek to the chefs here is the Italian food on the menu. But since the two countries are Mediterranean neighbors, it makes perfect sense that there’s some overlap. 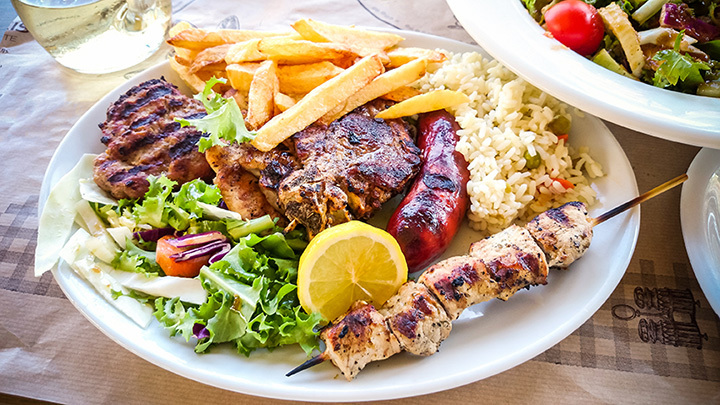 The Greek fare is absolutely authentic, capturing the sweet and savory flavors it’s so well-known for. You’ll find meat and vegetarian gyros, a garlicky eggplant dip, dolmades with pita, moussaka and a Greek salad and pizza. Grab some Greek sugar cookies on the way out the door for the ride home. It’s unlikely you’ll be smashing any plates at this restaurant, but there’s plenty of other fun to be had, maybe even a little dancing on the patio. Most of the enjoyment here comes from the food, lovingly made with fresh, high quality ingredients from tried-and-true family recipes. The lunch and dinner menu are a panoply of Greek favorites. A nod to their New Mexico location is the southwest gyro, topped with onions, green chile and cheese—something you’ll only find here. If you’re a gyro fanatic, this is the place for you. Take advantage of the gyro rewards club … buy nine and get one free! If gyros aren’t your thing, though, there are plenty of other popular choices. Try one of the combination platters to get a little bit of everything. Pastries are baked daily and a dripping honey-sweet goodness.